Patrick Iyamabo is the Chief Financial Officer of FirstBank. He has over 20 years’ extensive experience spanning various industries within and outside the county. Prior to this appointment in August, 2016, he was Chief Financial Officer, First City Monument Bank (FCMB). Patrick has cross functional exposures covering areas such as Audit, Strategic Management, Mergers and Acquisition (M&A) and Finance. He started his career with the then Arthur Anderson (now KPMG Professional Services) as an Auditor and rose through the ranks to the position of Experienced Manager in the Audit & Risk Consulting Practice. He worked at various times with Booz Allen Hamilton (New York) and L.E.K Consulting (Boston) as an experienced Strategy and M&A consultant advising private and listed corporations in the US. Patrick holds a Bachelor’s degree in Pharmacy from Ahmadu Bello University, Zaria and MBA From the prestigious Wharton Business School, University of Pennsylvania, USA. 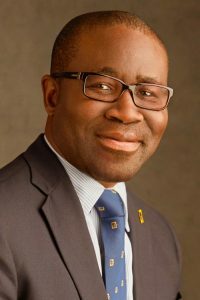 He is a member of various professional bodies including Fellow, Institute of Chartered Accountants of Nigeria (FCA), Associate, Chartered Institute of Taxation of Nigeria (ACITN); Honorary Senior Member of the Chartered Institute of Bankers of Nigeria (HSM) and Certified Information Systems Auditors (CISA).